T bought me Baked Explorations recently, there might have been some heavy hinting on my part, but I'm still grateful. It's fantastic, the photography is beautiful, the graphic design is cool and the recipes are delectable. 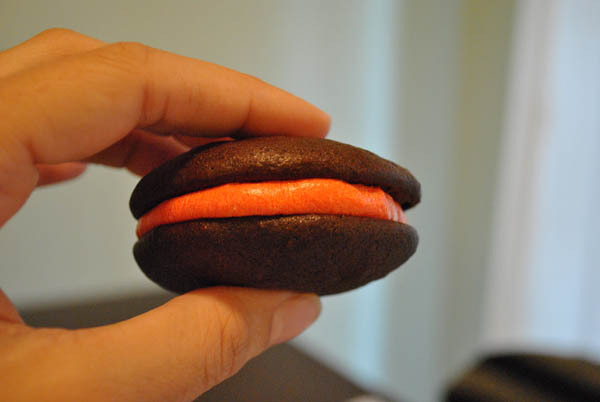 I was immediately drawn to the two whoopie pie recipes. 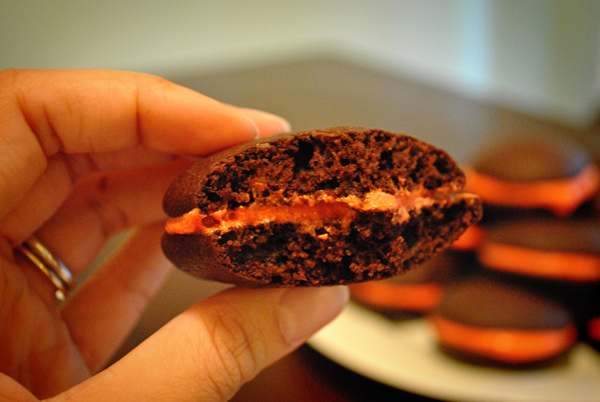 I had never made whoopie pies and I felt it was time to see what all the fuss was about. 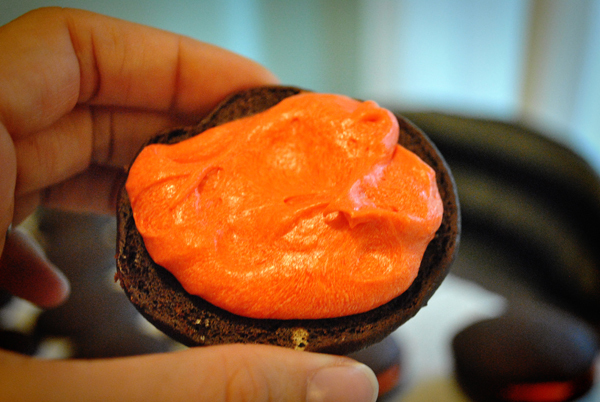 I used the Chocolate Whoopie Pies recipe (p. 108) for the cookie portion and for the filling I used the cream cheese recipe from the Red Velvet Whoopie Pies (p. 117). 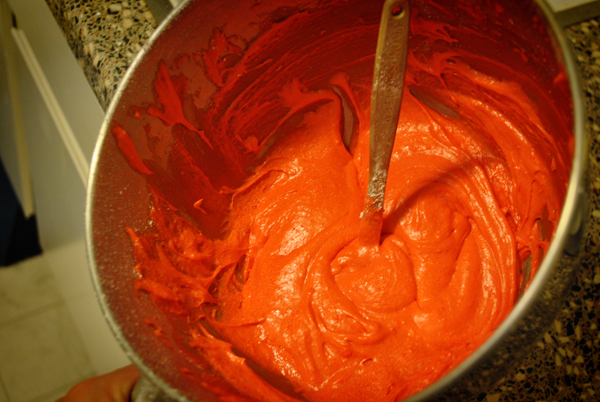 In large bowl, whisk flour, salt, baking powder, baking soda. In another large bowl, whisk the cocoa powder and coffee until cocoa is dissolved. In a medium bowl, stir the sugars and oil together. Add to the cocoa mixture and whisk until combined. Add the egg, vanilla and buttermilk, whisk until smooth. Fold dry ingredients into the wet. 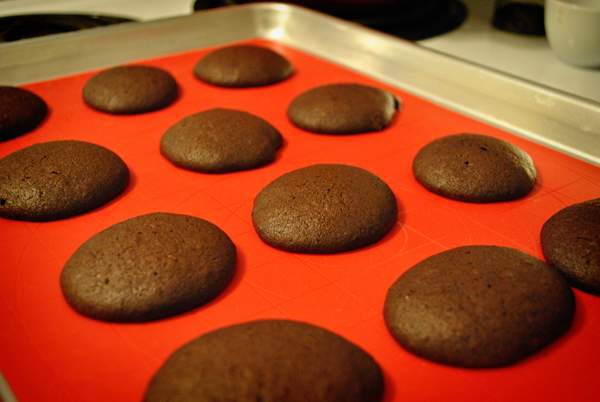 Drop by large rounded tablespoonfuls onto baking sheets about 1 inch apart. Bake for 10-15 minutes, until cookies are set and a toothpick inserted into the center comes out clean. 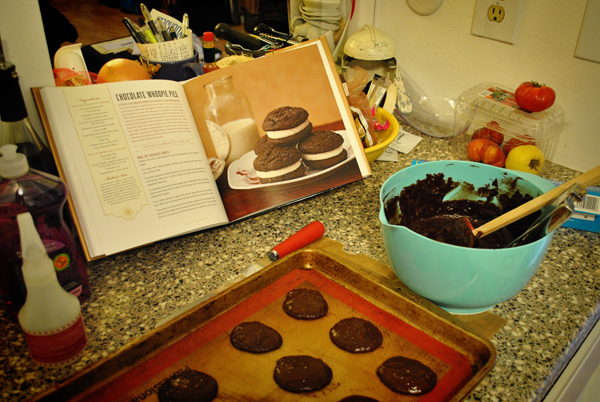 Makes about 4 dozen cookies (2 dozen whoopie pies). Cream butter and cream cheese together. Add vanilla, salt and food coloring. Add sifted powdered sugar in batches until filling reaches desired consistency. I made these for Halloween (just felt a need to explain the haz mat suit orange). Assemble the pies. I started out by matching up cookies that were similar size and shape so I wasn't left with a weirdly paired pie at the end. Then scoop on some filling and sandwich them up. Mmmmm. These cakey cookies came out great, they held together well, but were still soft and delicious. I tend to hate coffee in desserts, but the coffee in this recipe just makes the chocolate better, no more no less. Paired with cream cheese frosting (always a winner) these pies just couldn't be beat. I will have to make these again as soon as I have a chance to give them away, or else I would absolutely eat them all. Oh, I wish I could eat my screen right now. Miraculously, these lasted a couple of days. They were still fantastic the next day, but the day after that, they were on their way out, still good, but not as good. So eat 'em quick, tough, I know.